I am delighted to be with you on this lovely autumn day here in the glorious Hong Kong on the Hudson. I am, particularly, pleased to be speaking to members of the China Institute in this, your 90th anniversary year: nine decades of advancing a deeper understanding of all things China. All things, including mahjong, I am pleased to note. Unfortunately, I am a little early for the "Mah Jongg in Jewish and Chinese Heritage" evening to be staged later this month. I understand this interesting, and surely entertaining programme is the result of a partnership between your Institute and the Museum of Jewish Heritage. And isn't that the American way: Jewish and Chinese traditions in the spotlight, on show in a Manhattan museum around the corner from Wall Street, the Financial District of America - and the world. Apart from our shared passion for the one-of-a-kind game of Mahjong, Hong Kong and the United States have long been the best of partners in trade, in business and in finance, and of course, in making money. Hong Kong today is the world's eighth-largest trading entity. Our total goods and services trade is equivalent to more than four times our GDP. And the US is our second-largest trading partner. As for Hong Kong, we are your ninth-largest export market. Last year, Hong Kong bought US$37 billion worth of goods that were made right here in America. Products of every kind, from telecommunications equipment to fashion and jewellery, works of art and antiques to a welcome bounty of agricultural products. Meat in particular. Last year, Hong Kong was the US's fifth-largest market for beef and veal exports. Imagine that: just over seven million people, and yet Hong Kong is among the world's largest consumers of American meat. We welcome American companies, too. Indeed, some 1 400 US companies are operating out of Hong Kong, and nearly 90 000 people of US nationality call Hong Kong home. So it shouldn't surprise anyone here when I tell you that the American Chamber of Commerce in Hong Kong is the largest international chamber in our city - and one of the largest business chambers outside the US. In fact, companies, and capital, from all over the world are happy and flourishing in Hong Kong. Last year, Hong Kong was the world's second-largest recipient of foreign direct investment (FDI), right behind the US, according to a United Nations report. FDI inflows to Hong Kong amounted to US$175 billion in 2015, a year-on-year surge of 53.5 per cent. I would say that reveals the confidence international investors and enterprises have in us, in Hong Kong. And I can tell you, we have worked hard to earn this. Last month, Hong Kong topped the annual Economic Freedom of the World Report, published by the Cato Institute and the Vancouver-based Fraser Institute. Hong Kong has done so, by the way, every year since the report first came out back in 1996. Earlier this year, the Washington-based Heritage Foundation did the same, naming Hong Kong the freest economy in the world - and for 22 years in a row. More than freedom makes our business world go round. In May, Hong Kong was ranked the most competitive economy in the world by the International Institute for Management Development in Switzerland. Such international kudos, year after year, reflect the free flow of capital and information, in and out of Hong Kong. They reflect, too, our rule of law, buttressed by an independent judiciary, our efficient market, our extensive logistics network, and our ruthless resolve in combating corruption. Hong Kong is one of the safest cities in the world in which to live and work. Our crime rate, especially when it comes to violent crime, is low. Reassuringly so. Our business playing field is absolutely level for all companies, wherever they come from, whatever they do. Providing, of course, what they do is legal. Then there is our low and uncomplicated tax system, with profits tax capped at a cheering 16.5 per cent. Salaries tax rings in at only 15 per cent. And there is no capital gains tax, no inheritance tax, no VAT. Even beer and wine purchases are tax free in Hong Kong. As you can see, there are plenty of attractive advantages in Hong Kong. Plenty of inviting reasons to look to Hong Kong for business. Life is never so sweet in a single direction. There is, to be sure, some cross fire. Some observers, including a few international credit-rating agencies, suggested that the slowdown in China's economy will create further downward pressure on today's flagging global economy. And that because of Hong Kong's close ties with the Mainland of China, we shall soon have to face the sobering consequences of the Mainland's economic slowdown. That is certainly not the way I see it. Economies everywhere have been hit with headwinds since the 2008 global financial crisis, and China can't be the exception. Even when China is now growing slower than before, it remains the major driving force of the global economy, contributing more than one quarter of the world's economic growth. In fact, China's slower growth is not unexpected, not unreasonable, certainly not after the double-digit expansion it has enjoyed over the past 30 years or so. More to the point, its growth target for 2016 is between 6.5 and 7 per cent. And isn't that the kind of economic nightmare we would all love to wake up to. Most of the finance ministers I know certainly would. In fact, they would be pitching a national parade for half of that. So, yes, China - the world's second-largest economy, the world's largest trading economy, and the world's largest manufacturer - remains a formidable force for growth. And it will continue to be so in this 21st century. One reason for my optimism is the continuing structural changes going on in China - both the supply-side structural reform and, with it, the rising change in demand. Increasing purchasing power, along with the expanding income of a growing middle class, is transforming China's economic engine. Long an investment, export-led economy, China is now shifting, gradually and perceptibly, towards a consumption-driven economy. Indeed, consumption expenditure is now China's largest growth driver, accounting for more than 70 per cent of its economic growth in the first half of this year. As China's economy becomes more services-led, the demand for high-end producer services is also growing. This is creating major opportunities for services providers around the world. And no one is better positioned to take advantage of this transformation than business in Hong Kong. After all, Hong Kong has played a dynamic and critical role in China's dramatic economic rise since it first began to open up, in the late 1970s. Our competitive advantages in trade and logistics, together with our cultural connections, made us the key entrepȏt for China in its emergence as an export economy and global manufacturer. The responsibilities continued to expand over the years. Soon enough, Hong Kong became our country's essential intermediary in channeling foreign investment and capital to fuel its extraordinary growth. Today, Hong Kong is China's international financial and professional services centre, helping to open up its capital accounts and internationalising its currency, the Renminbi, in the process. Hong Kong is the world's leading offshore Renminbi business hub. We hold the largest offshore Renminbi liquidity pool, counting some 750 billion yuan at the end of July. In the first half of this year, some 70 per cent of the world's Renminbi payment transactions were processed in Hong Kong. And about a week ago on October 1, the Renminbi became the fifth currency that has been included in IMF's (International Monetary Fund) SDR basket. That will surely mean a more central role for the Renminbi in transactions of global trade and investment. No less important, the Renminbi's IMF inclusion - along with the US dollar, the Japanese yen, the Euro and the British pound - is a milestone in the Chinese economy's integration into the global financial system. It is also a resounding opportunity for Hong Kong. Our deepening economic integration with China, of course, goes well beyond our dominant role in the Renminbi's internationalisation. Next month, the Shanghai-Hong Kong Stock Connect turns two years old. And the Shenzhen-Hong Kong Stock Connect is expected to be launched soon as well. Together, they will serve to enhance mutual market access between the capital markets of Hong Kong and the Mainland. They will also accelerate the opening-up of China's capital markets to the world, while boosting the Renminbi's global acceptance. There's more: the Mainland-Hong Kong mutual recognition of funds arrangement, now just over a year old, is finding good market response. 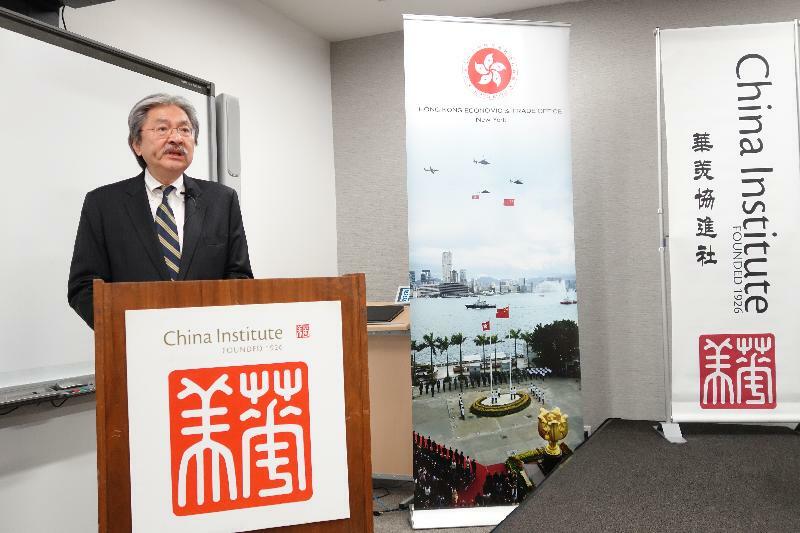 That unparalleled ability to serve as the critical intermediary between the Mainland and the rest of the world continues to create enormous opportunities for Hong Kong. I can tell you that opportunities don't get much bigger, more visionary, than China's Belt and Road Initiative. The far-reaching scheme seeks to deepen economic ties and infrastructure connectivity between some 65 countries in Asia, Europe and Africa. Railways, highways, ports, power plants, dams and more will drive the Initiative's future. The scheme encompasses two thirds of our planet's population and accounts for one third of global GDP, as well as one third of the world's merchandise trade. In short, it may well be the defining multilateral undertaking of this 21st century. According to the Asian Development Bank, Asia requires US$800 billion a year to cover infrastructure investment needs from now to the year 2020. The Belt and Road Initiative is about integration, connectivity, trade and investment, as well as people-to-people bonding. With our international and friendly business environment, our sound and robust market structure, as well as our unparalleled connectivity with the rest of the world, Hong Kong can surely play an important role in this ambitious undertaking. Indeed, as a truly globalised metropolitan centre at the heart of Asia, Hong Kong has the requisite experience, we have the requisite expertise, as well as network to serve as the centre for the fundraising, project financing and asset-management for all the big-ticket items. Our world-class talents, in accounting, architecture, urban planning, engineering management and more, can certainly help meet the huge demand for high-end professional services arising from the planning, implementation and operation of the Belt-Road projects. And our proficient and efficient logistics network can only further enhance our case. Hong Kong is located within five hours' flying time of half the world's population. Each day some 1 100 flights connect Hong Kong with hundreds of key destinations around the world. And our airport and ports are among the busiest and most efficient out there. As I see it, Hong Kong is on its way to becoming the Belt-Road's vital investment and financial-services hub. The bridge between China and the world. A golden bridge. And we look forward to working with you - with American companies, capital, investors and professionals. In closing, my thanks again to the China Institute for giving me today this welcome opportunity to share some time with you all. Thank you.